Sorry but gritting wouldn't work in these conditions. I wondered however, why there did not appear to be much in the way of gritting after it snowed the first time. I have yet to see a gritter despite weather warnings & heavy snow being forecast!! Gritting certainly worked on my estate so I think had it been efficiently distributed, it may have eased the stress & danger out on the roads today! Whilst a lot of people have been helping one another out, those out there who were determined to cut in, refuse to give way & seem to have some sort of allergy to indicating causing unnecessary breaking should be ashamed of themselves! Their lack of respect for human life is an absolute disgrace! We were all trying to get home in difficult conditions and none of us were enjoying it but most of us had the patience and good grace to drive safely! 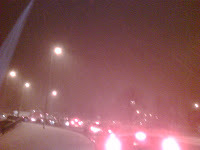 I've lived in Bracknell for a number of years now, always a problem when snow's about. When I commute to work, once I've left the Bracknell Forest area it seems the roads in surrounding areas have been dealt with. This has ALWAYS been the case. The weather pattern we experienced started on Thursday17th. Since then the gritters have been out every day laying salt. 22.00 hrs primary routes at 20gm/m2. Friday 18th - 04.00 hrs primary routes at 20gm/m2; 08.00 hrs secondary routes at 20gm/m2; 13.00 hrs secondary routes at 20gm/m2; 18.30 hrs primary routes at 10gm/m2; 22.00 hrs at 20gm/m2. Saturday 19th - 03.30 hrs primary routes at 10gm/m2; 18.30 hrs primary routes at 20gm/m2. Sunday 20th - 04.00 hrs primary routes at 20gm/m2; 08.00 hrs secondary routes at 20gm/m2; 1830 hrs primary routes at 10gm/m2. Monday 21st - primary routes at 10gm/m2. Landscape staff have been called upon along with Ringways' street cleansing staff to assist keep things moving. A few secondary routes in the Borough that should be gritted still have not been because of parked cars. The drivers of the gritting trucks have understandably had to apply caution in some instances and turn away. Credit must go to those staff that made the, in some cases enormous, effort to come to work in support of others. The people who supply our services have to get to work too! The Council very mind full of the need to collect the refuse before Christmas. Some people seem not to have not read the detail on the bin hangers or in the media about the day changes that are necessary to cope with the Bank Holiday. This and the ice are giving the crews a few challenges. Despite the difficult condition the team have been able to deal with the bins in all but 27 (at the last time I was advised) roads in the Borough. Those missed will be revisited on Tuesday 29th December 09. We are now into flooding and pot hole problems. There will no doubt be more of such issues over the rest of the holiday period and beyond. The pot holes will almost certainly be given only a temporary urgent repair. These will then be dealt with as soon as possible afterwards. Please report all problems to the 352000 number. Having them come this way really does help with the ability to understand the greater picture and deploy what resources the council has to the best use. There is enough salt to last over the long weekend and the gritters will be going out as needed. A decision on whether to go out tonight (24th) will be taken at 7pm. Please remember that the reason why a lot of people don't see them is because they go out when most people are in bed in order to lay the salt down ready for the cars to run over. If it then rains all that work can be lost. There will be some instances where the council could have done better. The council will be looking to see where it needs to better prepare for the next time. Click Herefor FAQ's and more about salt routes etc. Thank you Alvin that was very very imformative as usual. I'm sure people worked very hard indeed. I can see the resource problem. I guess it was a surprise for us here in Bracknell as our council is normally very good at gritting the roads. I and others did not notice that many gritted roads after the first snow fall dispite the stats you have. I agree with the gritting being badly managed in Bracknell. I have lived here for 23 years and the first coming of snow always get the "Fish" treatment (as in just in case it doesnt lets not jump and waste money)..like the hurricane years ago! That is not an excuse why the roads in Bracknell were so bad (and surrounding areas) can I ask if the council decisions are made by the same group of people or different groups following each others blind lead?..thats how it seems. ..."lets look out the window and send the gritters out cos its started snowing, oh no they are caught in the traffic!!!" - duuur!!! I understand councils like to save money, don't we all, but maybe they should set more rules on when to grit (eg when temperature gets to 3DegC or lower) then weather it snows or not, the roads are gritted. maybe we'll have to be careful cos of grit sometimes when its not snowing but once its crushed it'll be there in case. Another angle is why snow causes such problem. I have seen many perfectly capable cars being driven by drivers who have obviously forgotten that to pass their tests they were told how to manage gears to drive to in bad weather, yet they still put the car in a low gear and spin their wheels to get up a slope!!????? and wonder why we end up stuck behind them and traffic builds up.